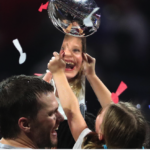 It was the lowest scoring game in Super Bowl history with people calling it a “Super Bore”, but the New England Patriots battled it out defensively against the Los Angeles Rams to pull out their sixth Championship win. With the game tied at 3-3 in the 4th quarter with 9:49 left, we saw vintage Tom Brady as he drove the team downfield for the sole touchdown of the game. Brady is the only player to have six game-winning drives in the Championship game, and the only player in NFL history to win six Super Bowls. Brady relied on the Most Valuable Player of the game, receiver Julian Edelman, who caught 9 passes for 128 yards. Brady and Julian are off to Disney World today to celebrate the big win! New England Patriots 13, Los Angeles Rams 3. While the game was unexciting until the final drive, fans were hopeful the halftime show would entertain. Unfortunately for the NFL, many described the entertainment as a snoozefest. Maroon 5 “played it safe” even though frontman Adam Levine went shirtless. Levine was joined by rappers Travis Scott and Big Boi. Gladys Knight’s performance of the National Anthem was the only part of the evening that fans universally agreed was terrific. At 74 years old, the “Empress of Soul” was perfection!